Locating turkeys is half the battle of hunting them. Some days they are plentiful, other days it seems like you can wear out a pair of boots just trying to find a feather. There are many tricks to the trade to find one of these giant birds. Cameras, glassing, calls; it is the ritual of springtime to hunt these birds and the thunder they emit keeps us coming back for more year after year. 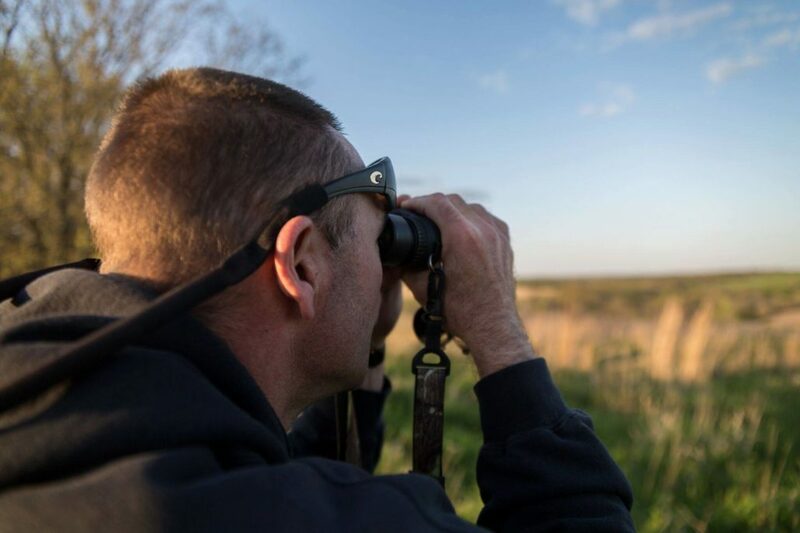 Taking the time to plan to locate birds will greatly increase your chances of success and overall enjoyment in turkey hunting this spring. Roosted is not roasted. However, locating turkeys the evening before your morning hunt drastically increases the chances you have of closing the distance on your target gobbler. Knowing where they are on the roost the night before allows you the chance to strategize from multiple angles on how and where to make your plan of attack under the bleeding rays of first light. Locating turkeys is possible in various ways and with a variety of different calls. Provoking a mature tom to give away his position can be the difference between success and tag soup. Shock gobbling is a common term used in turkey camps across the country. The term is used since it is an act of forcing a turkey to instinctually gobble because of a loud sound. These loud sounds can be anything from the slam of a truck door, a clap of thunder, a crow caw, a coyote howl or fox bark or most famously, an owl hoot. Shocking birds into gobbling is most well known as a pre-dawn and last light tactic when the birds are sitting on their roost. When they are sitting on the roost, gobblers tend to be more vocal since they are safe from predators and because they are trying to find the rest of the flock. Timing is everything. In the evenings wait to shock gobble turkeys until the last half hour of daylight. In the mornings, about half hour before shooting light is a perfect time to fire off a locating call. Setting up on a good listening vantage point is the first key. Being able to audibly survey lots of ground from a place where you likely won’t spook birds from their roost is where you need to start. High grounds, vistas, ridge lines and field corners within 200 yards of potential roosting trees should give you enough of a vantage point to let sound travel. In mountainous terrain, sound can be blocked by changes in the landscape. Having a circuit of listening points in hilly terrain to be able to call into individual valleys and hollows give you the chance to hear birds shock gobbling to your locating calls. When we think of locating calls to shock gobble turkeys traditionally hunters have used an owl call. An owl hoot produces the long range sound waves needed to shock a turkey into gobbling. 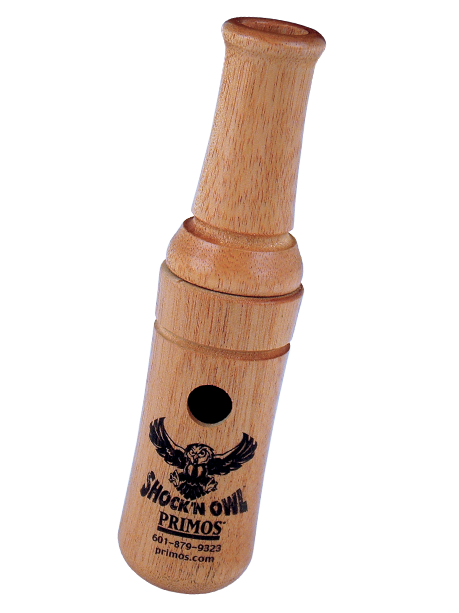 Primos offers an easy–to–use owl hoot called the Shock’N Owl. This custom hardwood owl call gives you the ability to produce different pitch owl sounds through the removable barrel. Whether you are on the hunt or are scouting for birds, the Shock’N Owl is a simple part of your call pouch that should not be left at home. If you do not have an owl call, fear not. There is a way to produce deep and long range owl sounds by just using your hands. First, hold your left hand up and flat but with no spaces in between your fingers. Second, take your right-hand cup your hand and lay your pinky along the crease where your left fingers meet the palm. Lay your fingers over the top of your right hand and bring your thumbs together to make an echo chamber? Did you ever call mourning doves as a kid? This is the same concept, but instead of using your left hand to make sound waves of a mourning dove, put your lips underneath the knuckles of your thumbs and blow directly downward in a controlled and strong breath of air. With practice, you can mimic the booming vocals of an owl and crush the distant ridge lines with sound to hopeful make a bird give away his position. In the middle of the morning or afternoon when the gobbling has fallen silent the turkey woods may be one of the loneliest places in the world. No matter how sweet you sound on those calls or how good those decoys look, sometimes the birds just don’t want to give away their position. Shock gobbling turkeys in the middle of the day is one method for locating them when you are hiking ridges. This is usually done with a crow call. The powerful short blasts of a crow have long been known to draw a response from a wild tom. 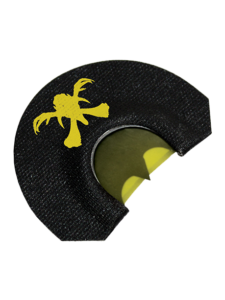 Next to your diaphragms, slate calls and shotgun, you will want to have a crow call in your vest. 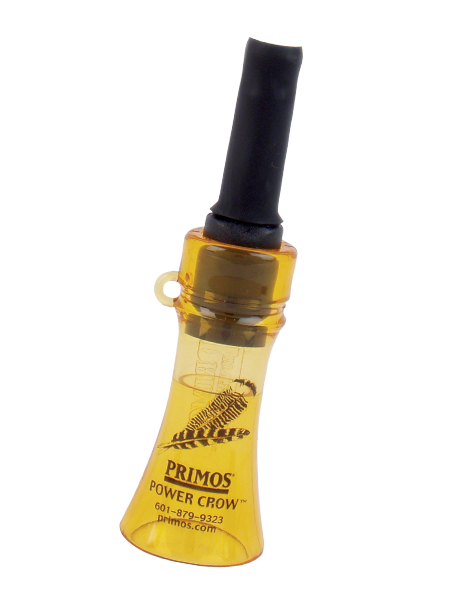 The Primos Power Crow is a simple crow call able to withstand the powerful blasts of breath producing the cawing sound of a soaring crow. If you know the area you are hunting well enough to understand the daily route of the birds, get out in front of where you think they might be headed, give three short blasts on your crow call and wait. If a bird does not respond quickly, keep moving as shooting hours are ticking by. 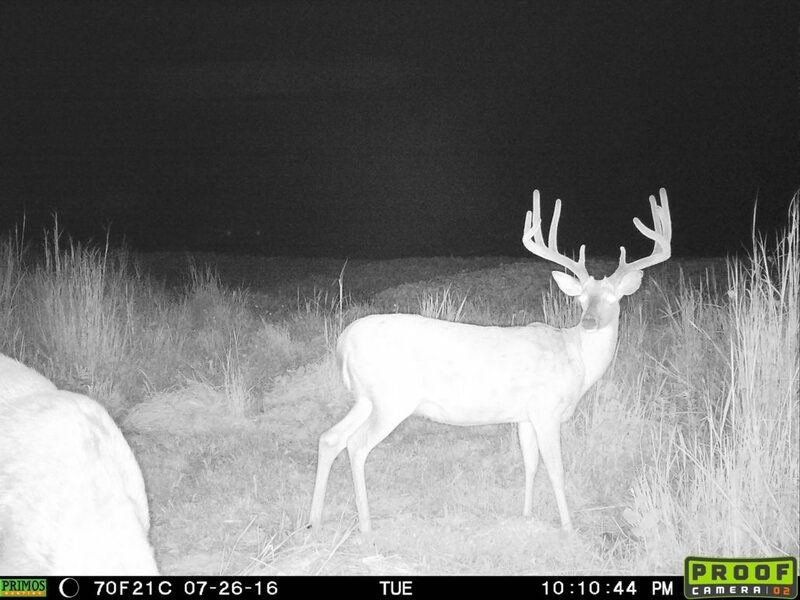 Trail cameras are most often associated with locating deer. 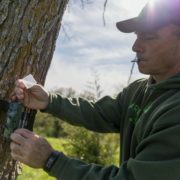 Trail cameras are a great tool for locating turkeys to give you their average travel times through an area. The Truth Series of cameras from Primos are simple and easy to set up over a known strutting zone to help you dial in the exact times of day they are passing through. Knowledge is power when locating turkeys in the middle of the day. Cameras can also be set to time lapse mode to take reoccurring photos of large areas like fields to give you an idea if an area is being used at all. Make sure to keep the camera at a slightly lower height on the tree when you set it up in order to not be taking photos of birds over their heads. If calls are not working to rouse up a gobble, glassing is the next best bet for locating a turkey. A good pair of Nikon Prostaff 8×42 Binoculars are more than sufficient to cover fields and locate turkeys. However, if you are driving roads it wouldn’t hurt to pack a quality spotting scope to be able to identify birds across big fields. The Nikon Prostaff 16-48x60mm Field Scope gives you greater detail and long-range viewing capability. 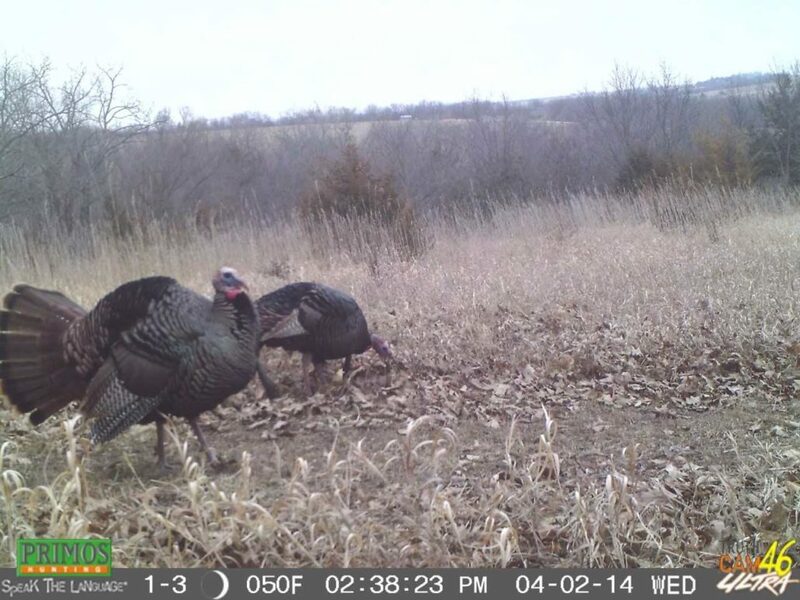 While there may not be anything you can do about a gobbler strutting in the middle of a field, but keeping an eye on where he re-enters the woods is a great way to plan for future hunts. When locating a turkey’s pattern through using cameras and glassing it can be easy to make a plan for a ground blind and ambush a mature gobbler. The Double Bull family of blinds are perfect for hunting turkeys since the interiors are black and the canvas used to create the blinds have no wind flaps. These blinds are like sitting in the Taj Mahal for a morning of hunting. Just remember to have a trigger stick and the QS3 Magnum seat to stay comfortable and steady for the shot. This seat is specifically designed for the Primos family of blinds since they are the same height as the openings. The perfect seat for both bow hunting and gun hunting for turkeys. 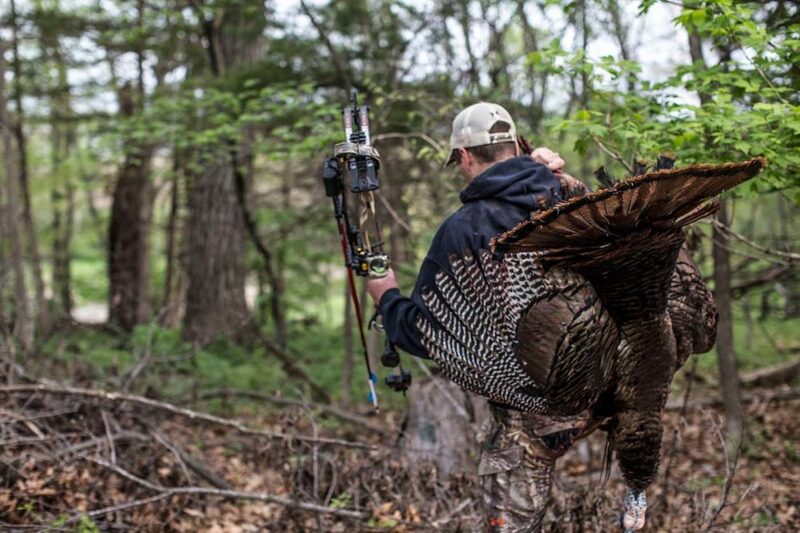 If the woods have fallen silent, head back to the last place you heard a turkey gobble and set up to call. Often times this is a great way to locate a turkey as they are also circling back to the last place they heard hens since they are alone in the late morning and afternoon. Sometimes the wait is short, other times it can last well into the afternoon hours. Especially late in the season when most of the hens have been bred this can be the ticket to success. However, toms are known to head back to the last place they heard a hen late in the morning and through the afternoon. 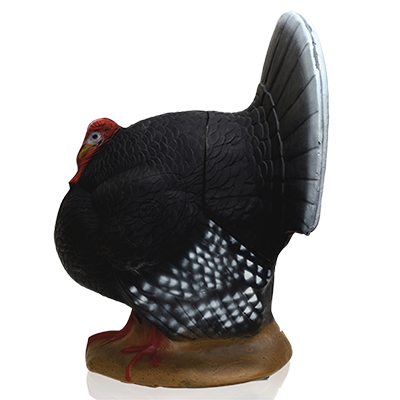 Take a single hen decoy like the Primos Gobbstopper Hen and set up in a location of great visibility. Loud raspy yelps from the Hook Series of diaphragm calls can reach farther than most pot calls letting that gobbler know you are back in the area. If he responds it is likely he will be lonely and looking for love. So get down on your gun and don’t peak since he will come in hot. Learning how to locate turkeys and locating gobblers can be maddening. You might go days at a time without hearing a bird which can drain your patience for staying in the woods. The challenge of finding a mature gobbler takes time and effort but makes touching that trigger on a sunny spring morning worth the frustration which comes with hunting turkeys. Bow hunting turkeys adds another challenge to the often times difficult feat of harvesting a spring tom. Most hunters know the number one reason why bow hunting turkeys is so difficult…the draw. A turkey’s eyesight is its best defense, and a hunter drawing a bow back is more than enough movement to spook a bird. In the face of a challenge, a solution usually reveals itself. 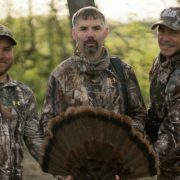 Bow hunters pursuing spring turkeys now use specific turkey hunting gear that makes this challenge a bit easier with a lot higher success rate. Watch the video below to see the top three things a bow hunter needs when bow hunting turkeys! 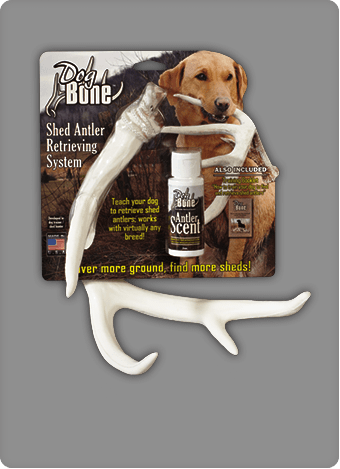 When bow hunting turkeys, these items are an absolute necessity! Each piece plays a critical role in the success of your hunt and without one, the other items and your hunt might render useless. Most of the time, a multiple decoy setup will create the ideal turkey decoy setup to bring in toms. However, adding extra elements of realism to the setup increases the attraction to a bird that might potentially hang up out of range. 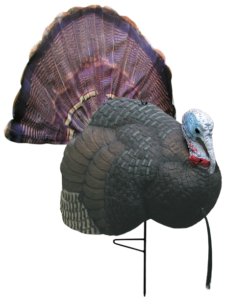 The Primos B-Mobile™ turkey decoy offers an aggressive reaction with the addition of movement! This paired with realistic hen decoys creates the ideal setup to bring a tom within range for a bow shot. Again, the hardest thing about turkey hunting with a bow is the point in the hunt where the hunter must draw back. The keen eyesight of a tom, especially with multiple birds is covering that draw up. 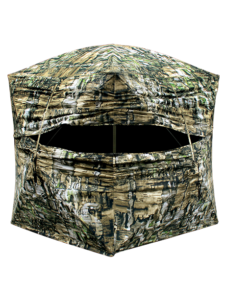 A spacious ground blind with plenty of room and cover, combined with a black shirt, hat, and facemask will allow you to become invisible to a turkey. 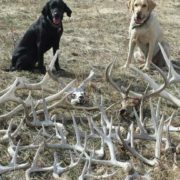 Other key features to look for when searching for a blind to hunt out of would be the ground blinds function on the hunt. 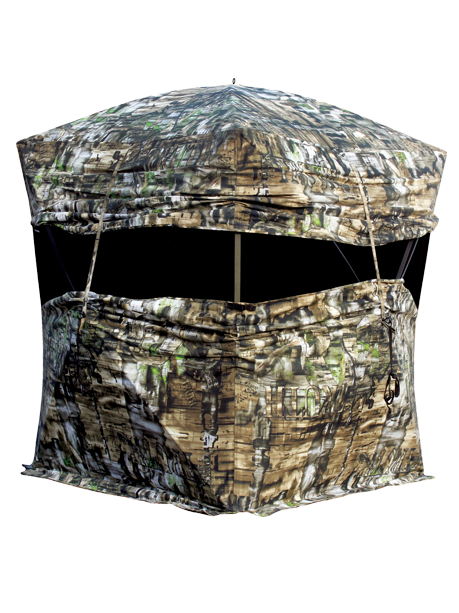 A quite, light, and easy to set up blind creates an ideal scenario when turkey hunting. Whether you favor turkey mouth calls, pot calls, or box calls, having a turkey call that you can effectively simulate a seductive hen with is perhaps the most important piece of turkey hunting gear you can have. Your turkey calling does not have to be perfect by any means, if you can at least get the correct cadence down, your turkey decoy setup should do the rest! If you plan on walking into the turkey woods this spring with a compound bow in hand, remember to bring these three things with you. A turkey blind, turkey decoy, and turkey call all work together to optimize your chance for success when bow hunting turkeys this spring. If you have children in your life, you likely want to pass some of your outdoor passion and skills onto them at some point. You probably learned how to hunt from your parents or grandparents and have many fond memories of it. Now you desperately wish to be that kind of youth hunting mentor to the next generation. 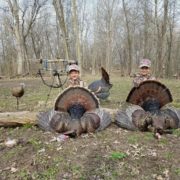 The spring turkey season is the perfect way to get them involved right now and teach them the skills they need. But turkey hunting with kids can be frustrating sometimes. It’s not always easy or enjoyable, and that’s especially true when you don’t take the right approach. If you miss certain truths about hunting with kids and don’t take the necessary preparatory steps first, it will be an uphill battle you’re likely to lose. What’s worse, you could risk turning them off of hunting for several years or throughout their lifetimes if you do it wrong. 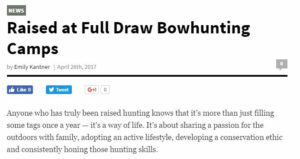 But it’s obviously critical for more youth to get involved in hunting again. As each generation grows up and more people leave rural areas for cities, the number of hunters drops. That’s a huge problem. Hunters are largely responsible for funding wildlife and habitat projects across the U.S., and have a real interest in the success of those programs. Hunting can also teach kids many core values that are important and relevant in their everyday lives. So if you’ve been thinking about taking your kids turkey hunting, now is the time. As you start turkey hunting with kids, you need to remember one thing above all. Make sure you take time to teach your kids about safe hunting practices. Even if they’re just sitting with you and not physically pulling the trigger, they need to understand what’s safe and what isn’t. That means you also need to demonstrate safe behaviors yourself. Kids learn mostly by observing role models in their lives. If you take time now to set a positive image in their minds, they will be more likely to be safe hunters once it’s time for them to go out on their own. There are a couple things you can proactively do to keep your kids happy (and you sane) while turkey hunting. That’s probably the biggest principle you can take away from this article: keep things fun. If your kids don’t have a good time or they feel like they’re being yelled at or ridiculed, they might be more inclined to pass on the next hunting trip. Not to say you should coddle them either; take advantage of teachable moments without resorting to yelling. It’s often been said that the hardest thing to teach a kid is to be still. Just look at them. They’re always reaching for something, fidgeting around, or not-so-quietly whispering something. Obviously all of the above are bad news when it comes to hunting turkeys. Wild turkeys have amazing eyesight and can notice when you even slightly shift your shotgun, let alone when your son or daughter is practically vibrating. In addition, the weather during turkey hunting season is usually pretty dicey, especially in the early parts of the season. It wouldn’t be uncommon to hunt in cold, windy, and rainy conditions. As you can probably guess, that’s some of the worst weather to try turkey hunting with kids. That is, if you’re exposed. The easiest way to conquer those issues is through using a hunting blind. Within a blind, they can stay dry, feel comfortable, and have the freedom to move around a bit without jeopardizing your hunt. Primos® Double Bull Bullpen blind features 180-degree view and plenty of room for a couple kids and even a camera man. Placed on a clover field or hay field that greens up ahead of most other food sources, you can be sure you’ll see turkeys. Even if it’s all hens and jakes, just being able to watch turkeys in the wild is a valuable opportunity for your child. But a word of warning: a hunting blind should not mean a free pass for your kid to do what they want. They’re still learning how to hunt turkeys after all, which means holding still and being quiet. If they don’t learn that lesson while in the field, they will be set up for failure later on. If your child is of a legal hunting age and can actually hunt with you instead of just observing, you need to set them up for the best possible outcome well before you go hunting. Plan on practicing shotgun youth shooting skills beforehand until you feel they can make an ethical shot and handle the pressure. Let them pattern their youth shotgun on a turkey outline so they can feel confident about themselves and not fear the recoil. 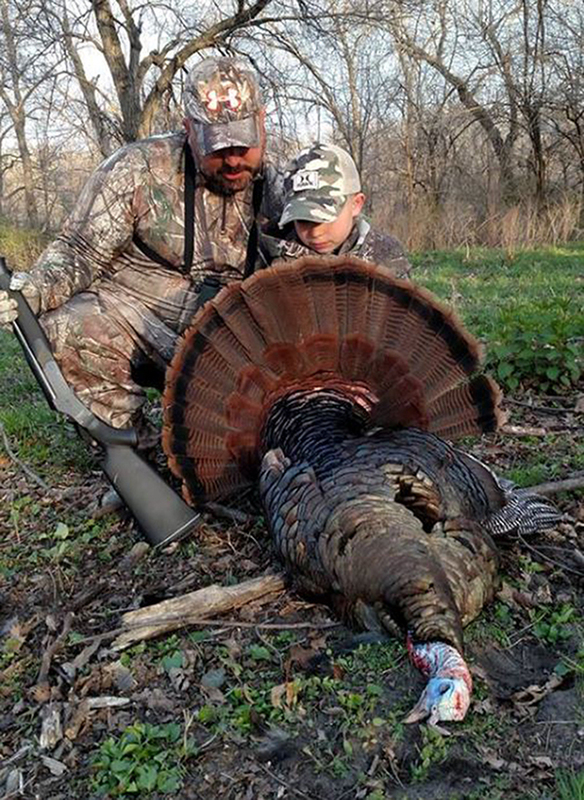 Teach them how to use their own Primos® turkey calls and practice with them in the weeks before the season. In the field, let them do a few calls themselves. It might not sound great, but that will be a learning experience in itself. Take time to watch turkey hunting videos together and make sure they understand the process as much as possible before you go out. As mentioned earlier in the article, the best way to fuel the hunting fire in your son or daughter is to have fun with them. Turkey hunting with kids can be frustrating, but only if you go into it with the wrong expectations. 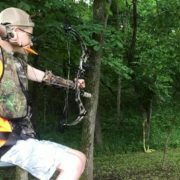 Try to not pressure your kids into hunting with you; instead, ask them to go, but don’t push them if they don’t want to. Let them come to you. If they’re interested, go shopping with them and let them pick out some of their own Realtree® turkey hunting camo clothes. 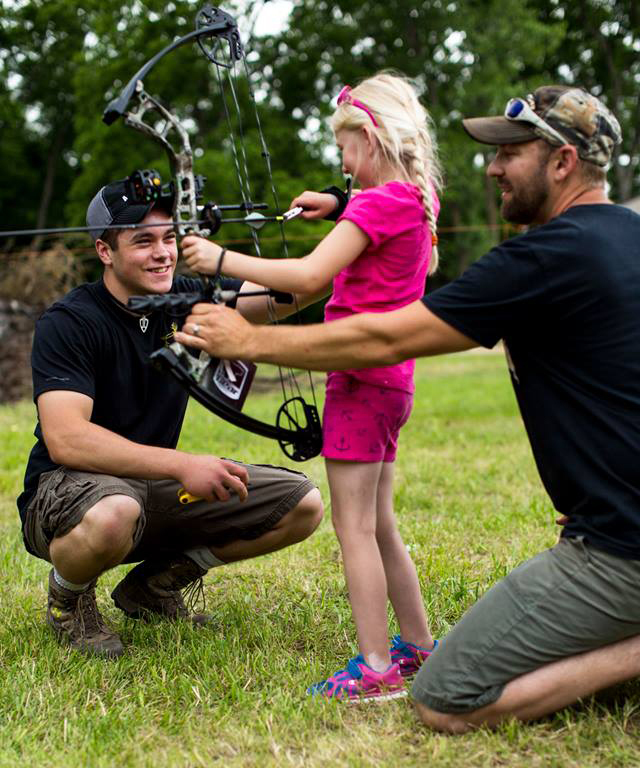 Adopt a different frame of mind when you hunt with your kids. You’re not really out there to kill a gobbler; that’s just a bonus if it happens. You’re out there to spend time with your kids in a different capacity and introduce them to the beautiful sport of hunting. As such, keep hunts on the short side, especially if the weather is poor and you’re not in a hunting blind. As soon as they start losing interest or complaining, it might be time to pack it in for the day. But if you’d like them to stay as long as possible, bring some snacks and talk with them. Make it feel like a fun adventure with their mom or dad, not a boring time of being quiet. Remember that in the end, taking kids hunting can and should be a really fun experience for both of you. It should be a time of bonding, not frustration and anger. Also remember that hunting teaches life lessons that your child will really benefit from; don’t cheat them from it. Take time to be a good hunting mentor and role model for them, and you’ll gain a hunting partner for life. 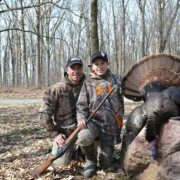 Preparing a youth hunter for their first turkey hunt can be exciting and daunting at the same time. 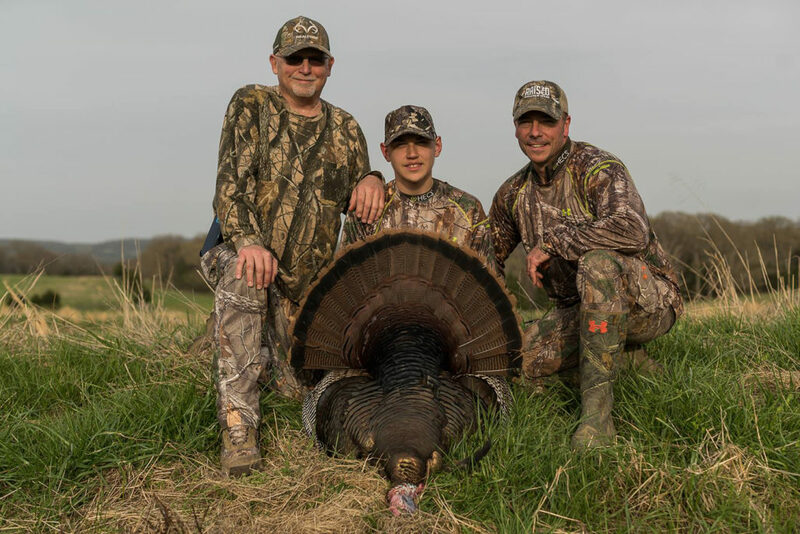 For a first time experience that will bring the highest shot opportunity, plan the youth’s first turkey hunt in an area during a time with the greatest chance for success. In many areas, the highest percentage of kills are between 8:30 a.m. and 2 p.m. These results are typically due to hens going to set on the nest during those hours leaving lovesick toms on the hunt for lone hens. Try to find a location to hunt with a good turkey population. Safety is the most important factor any time a firearm is being handled. It is imperative that you not only teach the safety rules to the youth hunter prior to the hunt, but it is also critical to keep reminding them at any given opportunity; repetition is key to instilling firearm safety. If the youth is under ten years old, it may be a good idea for the adult to carry the gun in and out of the field. However, the youth still needs to have a clear understanding as to the safety rules of handling a firearm. Once the youth is well versed on firearm safety, it is time to work on marksmanship. Before the youth ever takes that first shot at a turkey target, a mentor needs to take the time to explain turkey anatomy and the perfect aiming point for a swift ethical kill. It is important that the youth has the opportunity to experience some range time with the weapon they will be hunting with. For safety reasons and greatest results, the equipment should properly fit the youth hunter. It is critical that the youth is comfortable with whatever weapon they will use on the hunt. A youth model 20 gauge semi-automatic shotgun would be the perfect combination for smaller framed youth hunters; whereas a 12 gauge can be handled easily by larger framed youth hunters. Shorter barreled shotguns will weigh less but have been known for a little more recoil. The shotgun should have a highly visible sight system such as a bright bead system or a red dot scope. Using light loads on the range will result in the lowest recoil and will allow the youth to become comfortable with shooting while building marksmanship. For accuracy and correct sight picture, use life-size, realistic targets such as Primos Shotgun Patterning Turkey Targets. 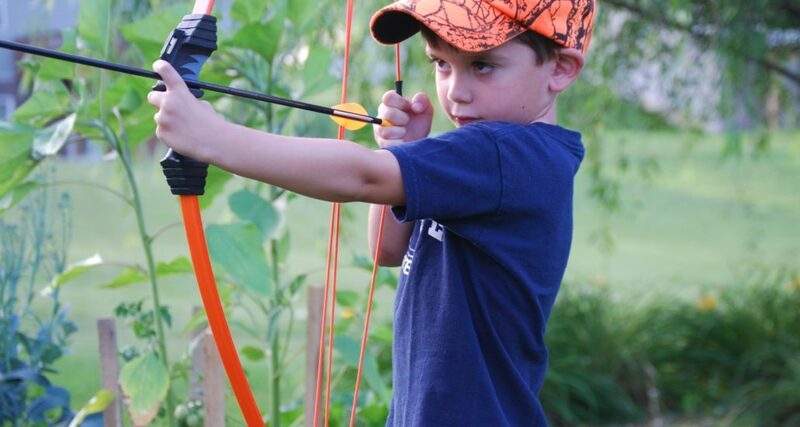 If they are a young bow hunter by chance, make sure you outfit them and prepare them with the right gear. The Cruzer G2 is the perfect starting bow for a youth hunter. 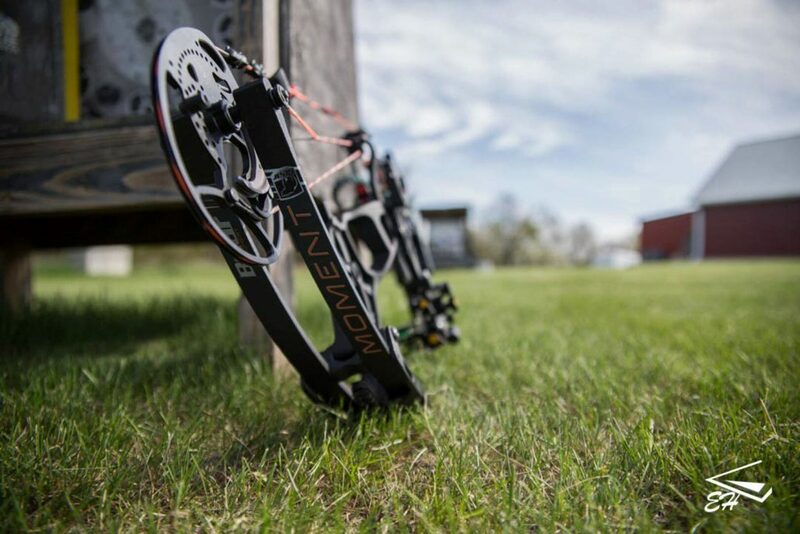 From 5 – 70 lbs, and 12- 30-inch draw, the bow is versatile to supply a tool for any age. 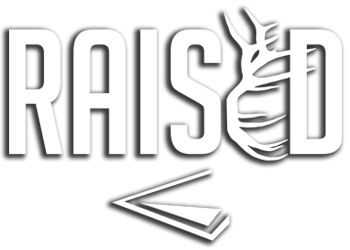 Youth hunters shooting crossbows and compound bows is on the rise and is quickly becoming a “one-size-fits-all” solution for families. Again, it is important that the youth hunter knows the anatomy of a turkey, knows where to place the shot, and is comfortable with shooting the crossbow or bow. This again goes back to teaching them where to shoot in relation to the position and body of a turkey. A real-sized 3D turkey target helps them get dialed in quick, ensuring that they are comfortable with the shot ahead of time. Parents often struggle with deciding what age is acceptable to introduce turkey hunting to youth hunters. Every child is going to be different, but the most important factor is that the youth is mentally and physically ready. Young kids can be restless because their attention span is much shorter than that of an adult. Occupy their mind with as much as possible but not at the sake of the hunt. Keeping the hunts short will be advantageous in efforts of ensuring that the youth has a positive experience. With younger children, hunting in a blind is the best solution for maximum coverage of any movement. The Primos Double Bull Blind has ample room in it for two people and offers a great range of view with maximum window adjustability for shorter shooters. 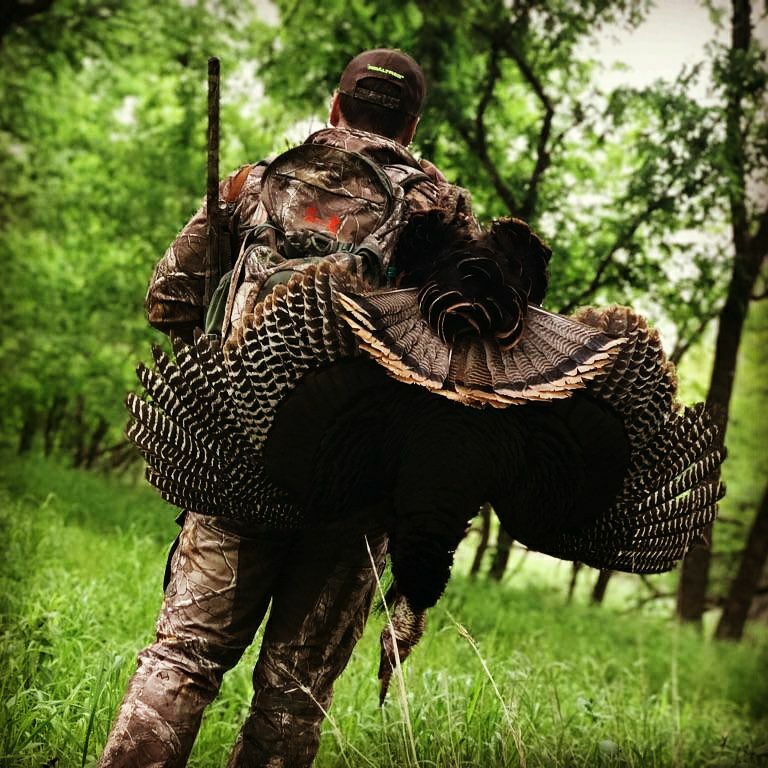 It is not a good idea to introduce turkey hunting on a day when harsh conditions are in the forecast but often this is something mentors will have no control over. Harsh conditions require adequate clothes and boots and when in doubt take extra layers or rainwear. Comfort is critical to the enjoyment of the hunt. Try to use a route to your hunting spot that is easily accessible and if that is not possible, take extra efforts in assisting the youth on the walk by carrying the gear and providing a low light source. Not all hunts have to start before sunrise. Younger youth hunters may be fearful of walking in the woods before daylight. It is also easy to get disoriented and harder to get set up properly with minimal movement. The time before daylight added to the time spent in the field waiting for fly-down light will make for a long hunt. If at all possible leave a little later, after sunrise, for those areas that you have scouted and know that the birds will take longer traveling to. 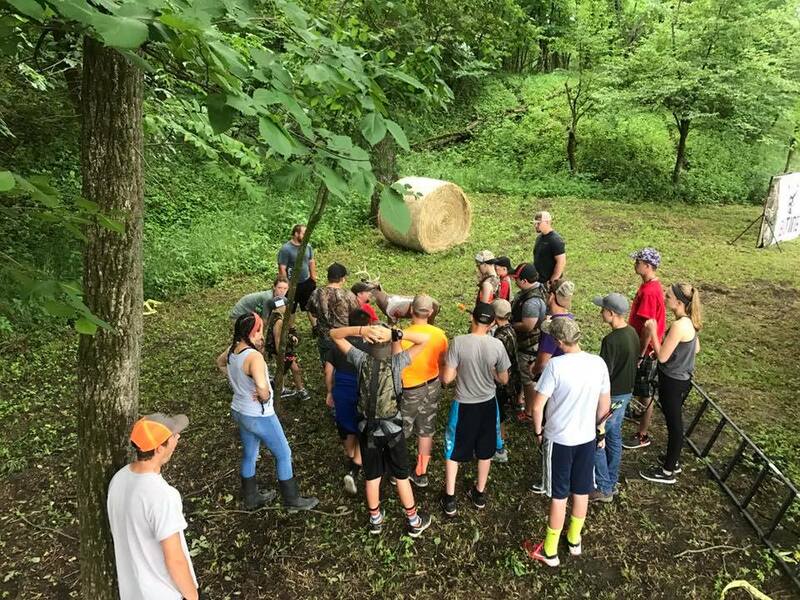 If you can involve the youth hunter in the hunt by allowing them to set up decoys or strike a call a few times, this will not only be memorable for the youth hunter; it will also give them a sense of pride that they have helped in the hunt. The knowledge of hunting must be learned through experience, and this is the most effective way of passing on knowledge to the next generation. As mentioned, practicing with a lighter magnum load is a good way to improve a youth hunter’s marksmanship, but once in the field, a heavier, denser ammunition will need to be used. On the hunt, 20 gauge 2 ¾” magnum ammunition will be plenty of shot for up to a 25-yard shot. For older, larger framed youth, a 3” 1-1/4 ounce turkey load will give the shooter up to a 30-yard shot max to ensure a clean kill. 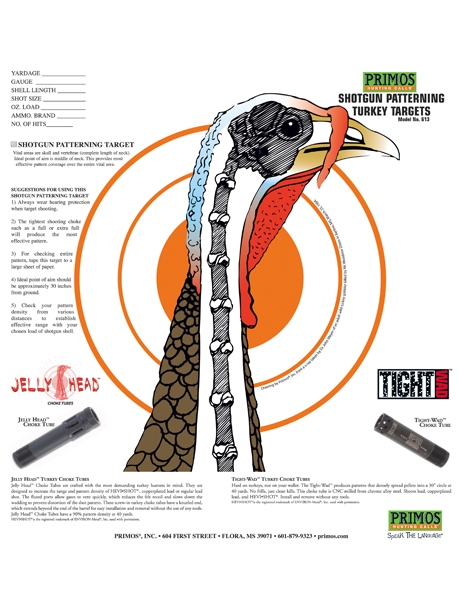 Using a turkey choke such as the Jelly Head Maximum or Tight Wad will ensure a denser pattern keeping most of the shot within the targeted area. Briefly reminding the youth hunter where to place the shot on the turkey is never a bad idea. A shooting stick that sticks into the ground, one that attaches to the shotgun, or a tripod such as the Primos Trigger Stick Short Tripod is recommended to steady the shot and can also assist a youth hunter in holding all of the weight of the shotgun up when a gobbler is taking its time coming into the setup. Decoys are not only helpful in catching the interest of a gobbler and enticing it to travel into the decoy setup, but they can also assist in preoccupying the Tom so that slight movements by the youth hunter can go unnoticed. There are numerous decoys available but it is always good to have at least one hen and one Jake or Tom decoy so you can entice a Tom to your setup. There is a myriad of ways to set up decoys for and effective set. However, the most important factor is to have the decoys close enough to the youth hunter that if the Tom hangs up just before reaching the decoys, it will still be within a comfortable shooting distance. Make sure that the youth hunter has a pair of quality binoculars. Binoculars are not only good for passing the time, but they will also come in handy for viewing birds and bird activity from a distance. Passive voice ear protection is important and should be worn by the youth hunter. Passive voice allows the youth hunter to hear your instructions without them removing the protection from their ears. There are a variety of styles on the market, from inner-ear to over-the-ear protection, a youth specific model will ensure that the ear protection fits properly affording the most protection available from the product and doesn’t interfere with the shotgun stock. Full and complete camo is crucial and must include a face mask and gloves for the maximum amount of concealment. Again, it is important to buy youth specific apparel for proper fit and best performance. A quality pair of boots that fit properly is vital to the comfort of the youth hunter. 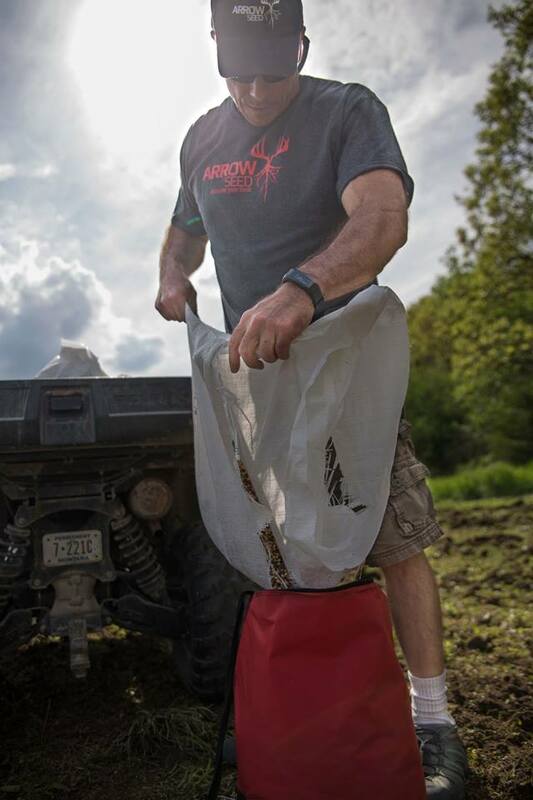 Waterproof boots are always a good idea turkey hunting because you never know when you will need to use creek lines, cross through ditches, or traverse across a muddy AG field to cut the distance on a gobbling tom. Snake boots or gaiters may be necessary in some areas such at the southern states. 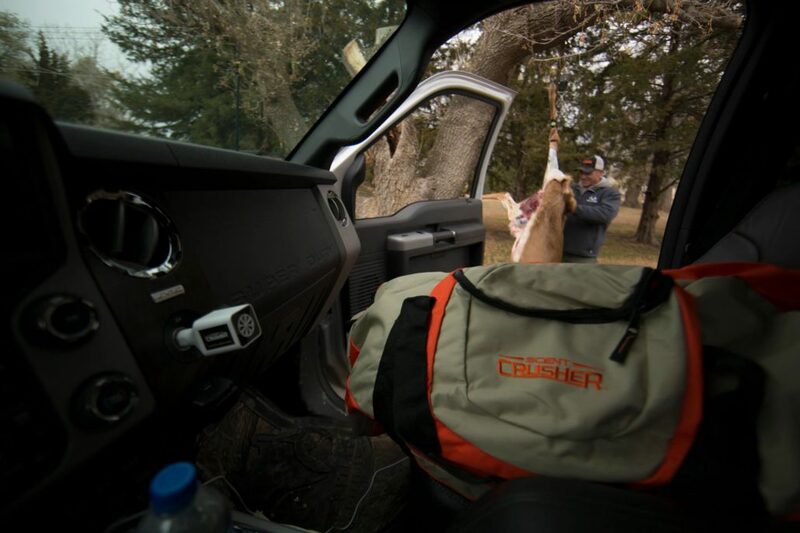 A turkey vest is not necessarily needed, but it is a good place for the youth hunter to keep any items they will take on the hunt and often offer a cushion for those times it is necessary to sit on the ground. As mentioned, utilizing a blind not only gives the maximum amount of concealment, it also offers the mentor the freedom of allowing younger or more active youths the opportunity to entertain themselves with a game, book, or to snack on food to occupy their time. When selecting a blind chair for the youth hunter, make sure it is adjustable to see over the blind windows, and the youth hunter is still able to touch the ground to sturdy or brace themselves for the shot. It is important for hunters to pass on the hunting heritage and conservation efforts to our youth; they are the future of hunting. As mentors, we should always strive to teach safety and ethics to the youth interested in hunting. 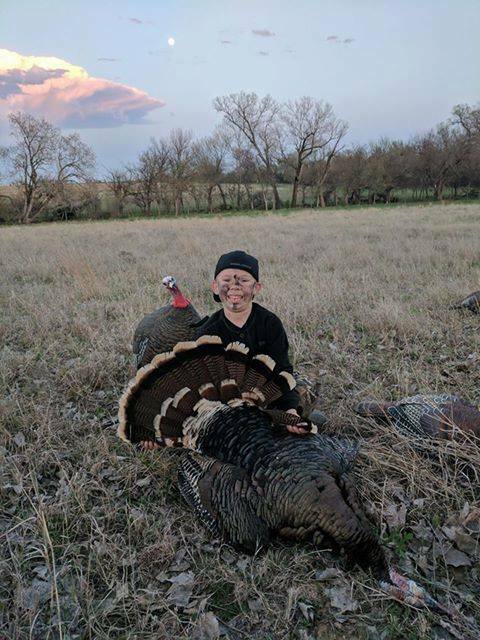 Taking a youth on their first hunt is not only exciting for the youth, but it is also something that the mentor will cherish from the experience if the hunt is laid out properly and planned for. Above all things, never hunt a youth longer than they want to be out in the woods or if they are uncomfortable. If the youth is ready to end the hunt, always remember, it is their hunt; end it on a good note and encourage them to return to the woods.